I received an email from someone at College of Idaho in mid-May asking if I had seen that Joe Martarano had been released by the Chicago Cubs organization. I replied that I had not. I received an email from someone at College of Idaho in mid-May asking if I had seen that Joe Martarano had been released by the Chicago Cubs organization. I replied that I had not. Then I added: since Maratarano is out of football eligibility at the NCAA level, would he still qualify to play under NAIA rules? Like, for the purple and gold? The C of I guy had just fired off an email to coach Mike Moroski. Well, it appears that’s what is going to happen. Martarano says he’s decided to play for the Coyotes as a senior linebacker this fall. He was poised to start for Boise State last season, but he left the program at the start of spring football to return to the Cubs’ farm system. That opened the door for a linebacker named Leighton Vander Esch to move into the starting lineup. In 69 career games in the minors, Martarano batted .252 with two home runs. He hit .340 for Eugene last summer upon his return to the Cubs organization, but he struggled after he was promoted to South Bend—then was hampered by an ankle injury this year in spring training. 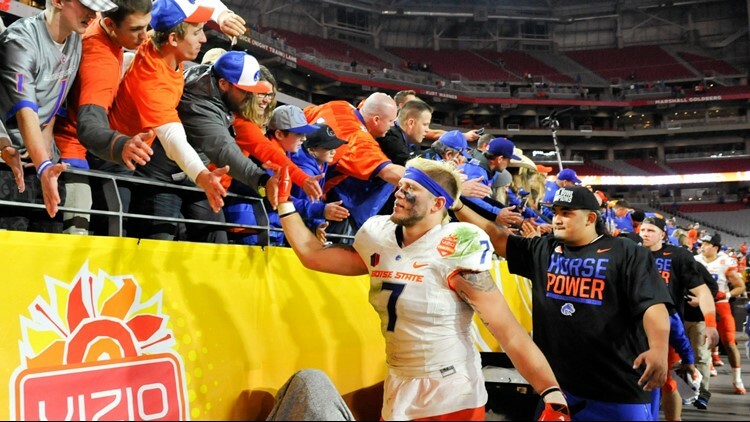 Martarano is a solid linebacker, having made 120 career tackles at Boise State with one interception. That one pick was of the highlight reel variety, a one-handed grab in the 2015 regular season finale at San Jose State. Martarano’s most memorable tackle in my mind was a monster stick on Washington running back Myles Gaskin that resulted in a four-yard loss in the 2015 season-opening win over the Huskies. A tone-setter indeed. ESPN Insider ranks all 32 NFL backfields a couple weeks ahead of training camp. You have to scroll all the way down to No. 18 to find the defending Super Bowl champion Philadelphia Eagles and former Boise State great Jay Ajayi. Writes ESPN’s Mike Clay: “The Eagles leaned heavily—and successfully—on a committee last season, with LeGarrette Blount leading the way in snaps and carries. Ajayi joined the team in Week 9 and, including three playoff games, handled 39 percent of the backfield snaps during his 10 games. Blount is gone, (so) Ajayi is expected to be the first man up in rushing situations, especially considering that his 2.4 yards-after-contact since entering the league is best among all backs with 500-plus carries during the span.” Sounds like the Eagles should be rated higher than 18th. Keep scrollin’, and you’ll find the Oakland Raiders rated No. 23 with Marshawn Lynch, Doug Martin and DeAndre Washington. Writes Clay: “Lynch is back for more in what is expected to be a run-first offense under coach Jon Gruden and coordinator Greg Olson, but Lynch is now 32 years old, and Oakland inexplicably signed Martin. The former Buc is averaging 2.93 yards per carry over the past two seasons, ranking in the bottom five of the category both years.” You’ll have to scroll about as far as you can go to get to the San Francisco 49ers at No. 29. There’s no mention of Jeremy McNichols. Longtime college football scribe Brett McMurphy was the first to advance the probability that the Las Vegas Bowl would part ways with the Mountain West after this season. Here’s a tweet from McMurphy last night—“Sources: Mitsubishi Motors Las Vegas Bowl is new name for Las Vegas Bowl. Mitsubishi Motors signs 2-year naming rights deal. In 2020, bowl will move to Raiders’ new stadium & expected to feature Pac-12 vs. SEC.” You know this is going to happen, right? Mitsibushi would not put its name on this game otherwise. Now we’ll see if a second bowl is created in Vegas that the Mountain West can latch onto. Chandler Hutchison was dishing early and scoring late in Chicago’s NBA Summer League loss to Atlanta yesterday. Hutchison put up eight points and eight assists, but sprinkled throughout were five turnovers. That’s clearly a part of his game the Boise State alum is going to have to work on moving forward. Six of Hutchison’s points came on a pair of three-pointers—he’s been confident from beyond the arc in Las Vegas, despite having to launch from as much as three feet further away than he did as a Bronco. Now each team in Vegas will be seeded in a tournament-style circuit that will determine the NBA Summer League champion, with the title game set for next Tuesday. Two other Boise State notes: the Bronco women’s basketball team has unveiled its 2018-19 schedule, and there’s a marquee game on the home docket (do you think?). Louisville will come into Taco Bell Arena on November 19, fresh off its run to the Final Four in the spring. It was the Cardinals who beat Boise State 74-42 in the first round of the NCAA Tournament in March. And Bronco sophomore-to-be Emily Venters finished ninth yesterday in the 5,000-meters at the IAAF World U20 Championships in Finland. Venters was one of only two Team USA runners in the race. The first-ever Chrono Kristin Armstrong on Friday has all the makings of a big annual event in the Treasure Valley. The international field in the 15-mile time trial features several past world champions and teams that include Egypt and Morocco. The $35,000 event, part of the UCI America Tour and the only event of its kind in the U.S. in 2018, starts at Hunter’s Creek Sports Park in Star and finishes on the drag strip at Firebird Raceway. There couldn’t be a better lead-in to the 32nd annual Twilight Criterium in Downtown Boise on Saturday night. Serena Williams beats Spain’s Garbine Muguruza in straight sets to take the Wimbledon title and complete what they called the “Serena Slam,” her fourth straight major championship. The 33-year-old Williams became the oldest Wimbledon winner of the open era and claimed her 21st career victory in Grand Slam events, setting the stage for a true tennis grand slam later that summer in the US Open. That didn’t happen, but Williams would win Wimbledon again the following year. The next day, Novak Djokovic won his third Wimbledon crown, beating Roger Federer for the second straight year. Djokovic was the first men’s champion to repeat since Federer won five straight from 2003-07.